If I were God and people asked me why I created Nigeria I’ll say I created it for a reason. I promised to lead the Israelites to a land of Milk and Honey and I did . Nigeria is a land of Milk and Honey but you’re too blind to see it and trample it under foot. If I were God and people asked me why I allowed the amalgamation of the Igbos, Yorubas and Hausa under one roof I’ll say I did it for a reason. People regardless of their tribes and religious affiliations should learn to live together. You are humans not aliens and your country is big enough for everyone. for a reason. You do not value the life of your fellow human beings. To you taking a life is like killing a fowl for dinner. Perhaps you should learn to respect the preciousness of a human life. If I were God and people asked me why I allowed evil to engulf your lives I will say its for a reason. I created you in my image but you chose for the darkness of evil to enter your lives, mostly, to proclaim your vanity. Be careful what you wish for; you asked for it and you got it! If I were God and you asked me why people are the way they are in Nigeria, I’ll say I created Man to love one another and not hate one another. I created the Sun to shine on the righteous and on the bad. I also created Rain to fall on your friend’s house and also on your foes house. Perhaps you should learn to love each other a bit more. If I were God and you asked why my ‘Men of God’ can’t help you or the country I’ll say I have no ‘Men of God’ amongst you. Many, since Time began, claim they come in my name. are they my chosen ones? That is for you to decide! If I were God and you asked me why I let the poor and needy to continually suffer – on a daily basis – I’ll say it’s for a reason. Why should some amongst you have more than enough and others are left with nothing? Unfortunately you haven’t evolved to the point to learn how to distribute your vast resources evenly – that’s for you to do! 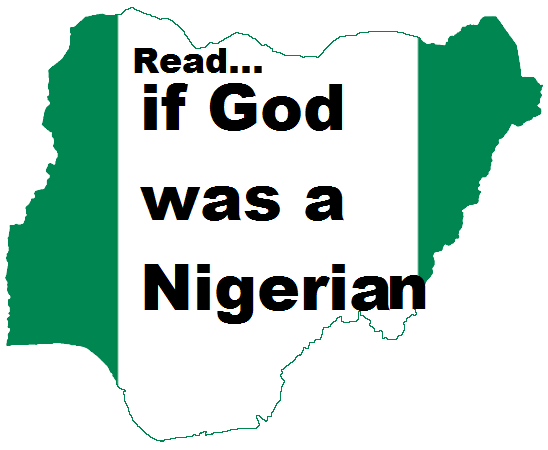 If I were God and you asked me why I let corrupt leaders rule Nigeria I would say that is your fault. If you elect corrupt leaders to high office you get what you voted for – blame yourselves! If I were God and you asked me why I stood by and let the Devil and his legion enter your lives I will say that is your fault. You opened your front door and willingly invited him in. If I were God and you asked me why nothing ever works out in Nigeria for the better, I’ll say blame yourselves! I gave you a brain and the ability to discern between right and wrong. But since you chose to go the way of Adam, in the Garden of Eden, that is your prerogative! If I were God and you asked me why I’m not fixing the problems in Nigeria I’ll say stop moaning and fix them yourselves! Nigeria is not the only nation in this world; there are many others and they fix their own problems. Perhaps it’s time the nation called Nigeria grew up and stopped blaming everybody else for its woes!